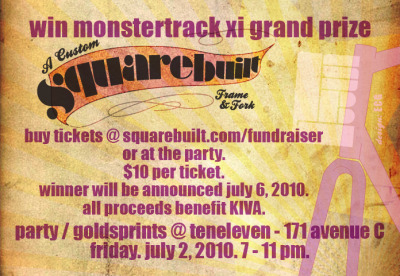 Today is your last chance to buy a ticket for your chance to win a CUSTOM Squarebuilt frame! $10 all goes to support KIVA. Last 3 digits of the Dow Jones closing average TODAY chooses the winner. Go here to buy your tickets! And remember…Price is Right rules, closest to the actual number without going over wins it…Strategy! « Happy 4th of July from the Clif Bar 2 Mile Challenge! How much money did this raise? Who is the lucky winner! ?